This is a summary for Kaitlyn from 7-7 years and 3 months old. Eating is going well. Kaitlyn has gotten a lot more self-motivated about eating her fruits and vegetables because McKenna is quickly creeping up on her in height. I tell her if she wants to grow taller, she needs to eat more fruits and veggies :). Summer is a great time for her, too, because of all of the fresh fruits and veggies we get out of our yard. Sleeping is great. No issues here. Kaitlyn did soccer and softball during this time (she loved both). 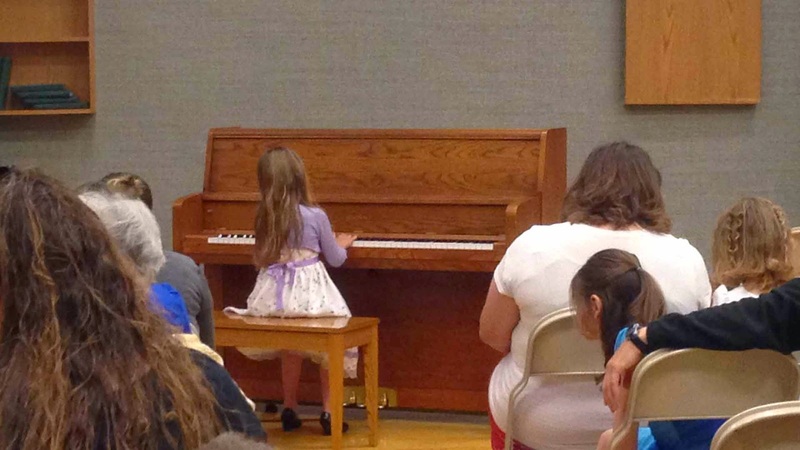 She finished up piano and dance. She continues on with swimming. She took a month off of gymnastics for summer. Now, these were first grade girls who were in a rec dance class. This wasn’t a comp class. This was just rec. She was intense and mean. Because of this, Kaitlyn grew to hate dance. She told me she wanted to not take it next year. I have zero problem with her not taking dance if she doesn’t love it, but before this year, she loved it. I also didn’t want her to end on such a negative experience. So I talked her into trying it out next year and promised we would move to a different studio so she would not have the mean teacher again. Toward the end of the year, the other moms and I started talking about how our girls were affected by this mean teacher. I mustered up the courage to ask other moms what they thought of the teacher. Kaitlyn has a good friend in the class, and her mother and I decided last November that we could not stay at this studio another year. I knew she felt the same as I did, but I didn’t know if other moms did. When I asked, I found out they all felt the same! And all the girls did, too. Most girls wanted to quit dance. Only a few were willing to try it another year (this was a class of 15 girls). Anyone I talked to who was going to do dance next year is moving studios. I have some major regrets here. At the beginning of the year and I noticed this behavior, I resolved to talk with the studio owner about it after their places were assigned. I didn’t want to sound like a scorned mom complaining about the placement of her daughter. I knew Kaitlyn would be put on the front row and at that point, I could talk with the owner. Then I found out the teacher is the owner’s daughter. That made me think talking to the owner would do nothing other than make the owner mad and the teacher take it out on Kaitlyn. So I said nothing. At the end of the year, when my daughter was to the point of hating dance, I really questioned that decision. I went to Kaitlyn and apologized to her for not saying something. I really felt like I failed her. Here I was sending my 6 year old, sweet girl into a room with a young woman who could easily be listed on the “top ten meanest dance teachers” list. And I said nothing when I heard her make mean comments. Nothing. Kaitlyn is completely non-confrontational and she told me she was glad I said nothing. My husband assured me I did what I judged to be the best for the situation at the time. And I did. It is what I really thought was the best thing. It was not driven by fear; I am not afraid of confrontation. I figured it was a time Kaitlyn would have to learn to adapt and adjust in a difficult situation. But I just don’t know. I honestly don’t know what the right path would have been to take, but I can tell you that if it happens again to any one of my children–at least when young, I will say something. Hopefully our new studio will be nice. The end of the school year went well for Kaitlyn. She did fabulous on all of her testing and she is reading really well. Kaitlyn still had a big crush on the boy who wants to marry her at the end of the year. He had an end-of-year party at his house and she was invited. She was getting ready for it and asked me if I thought Jake would think her shirt was cute. Ack! This summer, Kaitlyn did an art summer camp. Kaitlyn absolutely loves art and I knew the art summer camp would be something she would love. And she did. She totally loved it. She came home just beaming and excited every day. Kaitlyn primarily plays with stuffed animals, Legos, or art supplies. Her favorite books right now are any book that has a unicorn or dragon in it. Her current favorite is the Unicorn Chronicles series. She has been reading like mad this summer. She reads at least 5 books a week. She is easily reading 5-6 grade reading level books. Here is our typical summer schedule. We are pretty flexible here. I don’t mind if things get mixed up or even skipped. This is our blueprint. 7:00–wake up. Eat breakfast. Get Ready. 7:30–practice piano, then sibling play. My little sister once had a really mean horse riding instructor. She kept trying to tell my stepmom how mean the teacher was, but she just thought my little sister was being dramatic. It turned out she wasn't being dramatic. Ultimately, she made the same decision as you and just started taking her somewhere else to ride. I don't really understand why someone would want to teach little kids if they hate to do it.